Bearing Determination Test addresses spatial orientation skills, stress tolerance and capacity for sustained attentiveness of its takers in a multiple-choice approach. It uses static instrument readings only. Next to the instruments a (north-up) radar screen depicts a frozen traffic scenario with several aircraft around two ADF/VOR beacons. 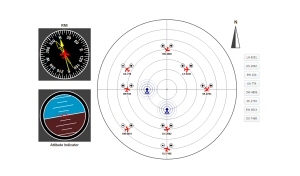 Bearing Determination Test requires its takers to find the aircraft in the grid the instruments relate to.